By the 1960s, Walt Disney Productions was best known for its top notch animation and live action comedies, which often featured animals. Walt Disney also had a star with one picture left on her contract, Hayley Mills, and was looking for a project that would showcase her comedic talents as an adult. When a book called Undercover Cat by husband and wife Gordon and Mildred Gordon arrived on his desk, it was a perfect starring vehicle for Hayley while upholding what audiences had come to expect from Disney. Bill Walsh worked with Gordon and Mildred Gordon to adapt the screenplay, embedding comedy into the characters while keeping the kidnapping serious. Gordon Gordon was a former FBI agent and the real FBI kept tabs on production of this film to make sure he wasn't giving away any confidential information. Robert Stevenson directed, having already established himself at Disney with Old Yeller, The Absent-Minded Professor and Mary Poppins. Surrounding Hayley Mills are many familiar Disney faces. Ed Wynn makes an appearance as well as Elsa Lanchester, who made her Disney debut as Katie Nanna in Mary Poppins. Dean Jones stars in his first of many Disney films and he would become the studios biggest star for the better part of the next decade. Roddy McDowall also costars in his first of several Disney films. Several cats were used to play D.C, one of which also starred in The Incredible Journey. Much of the film was made on the Disney studio lot and fans of Disney films from this era will recognize residential street from other live action Disney comedies. The Sherman Brothers wrote the title song, which is sung by crooner Bobby Darrin. The film opens with footage of D.C. the cat prowling the neighborhood to the film's jazzy theme song as the credits play. His prowl leads him to an apartment where two bank robbers are hiding out with a kidnapped bank teller they used to make their getaway. She tried to scratch "help" on the back of her watch, but is interrupted after the first three letters. She is able to slip the watch on the cat and send D.C. outside before the burglars find out. When D.C. arrives home and his owner Patti finds the watch, she tells her sister Ingrid who disregards it. Patti is sure that somebody is in need of help, so she scratches the missing "p" on the back of the watch and takes it to the FBI, hinting that it belongs to the missing bank teller. Agent Kelso sets up an operation from Patti's home so they can trail D.C. every night when he goes out. The stakeout is a secret, so Patti and Ingrid have to lie to their boyfriends to keep them away from the house. On the first night, D.C. realizes he is being followed and tries to evade the FBI team. Agent Kelso decides to put a mic and transmitter on D.C. the next night and he follows on his own. When D.C. doesn't lead him to anything usable, the FBI decides to stop trailing the cat. So Patti begs a jewelery store owner to call the FBI and claim that he sold the watch to the missing woman. Thankfully her hunch proves correct when D.C. leads Agent Kelso to the apartment. It leads to an eventful showdown and in the end, D.C. gets the credit for catching the burglars. The film ends with a reprise of the theme song and we find out that he has a girlfriend and kids as Bobby Darin warns that your cat could be one of his sons. 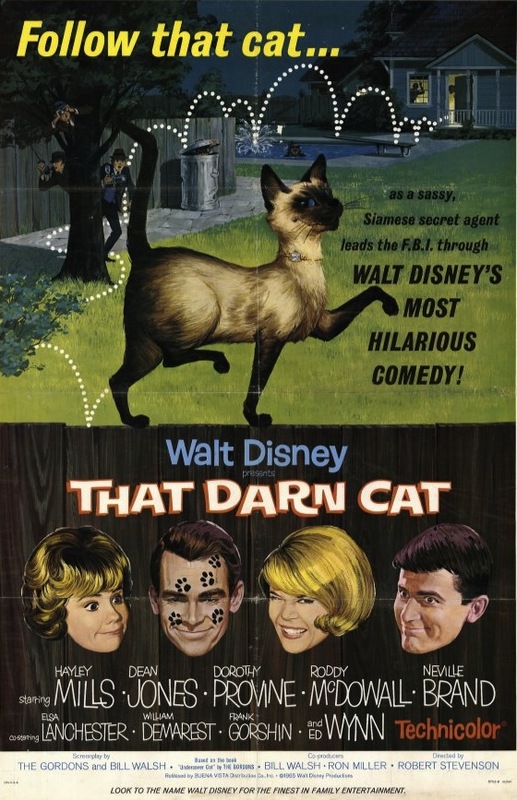 That Darn Cat was released on December 2nd, 1965. Critics enjoyed the film and praised the comedic scenes and the animal actors. It was a hit with audiences and made over $9 million in its initial domestic release. It was rereleased to theaters in 1973 and made its home video debut in 1985. 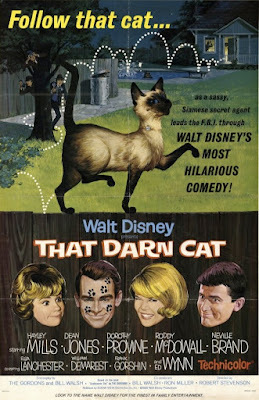 As far as Disney comedies go, That Darn Cat is one of the best. The premise is cute and many of the situations are hilarious. Some of the best moments come from Elsa Lanchester as the nosy neighbor and her husband, who delights in thwarting her efforts to spy on the neighbors. During the 90's when Disney began remaking some of its most memorable films, That Darn Cat was updated starring Christina Ricci and featuring Dean Jones in a supporting role. While that film is well done, it isn't as funny or as charming as the original. After the film, Hayley Mills chose not to renew her contract with Disney to persue more diverse acting opportunities. She returned to the company in the 80's for some television work, including a series called Good Morning Miss Bliss that spawned Saved By the Bell as well as made for TV sequels to The Parent Trap. That Darn Cat is currently available on DVD in a standalone release and in a 2-pack paired with the 1997 remake. In both releases, the film is presented in fullscreen, although its original theatrical aspect ratio was widescreen 1.75:1. A restoration was done and the film looks very good, but there aren't any bonus features for the original film.